In Hurawalhi Maldives exists an underwater paradise in the form of a restaurant in a five star resort. 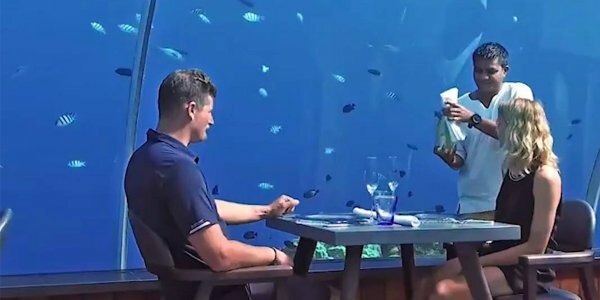 It is said to be the largest underwater restaurant in the world which is completely constructed out of glass and lies almost six meters below the island level. The experience is ethereal as well as luxurious as the restaurant provides mouthwatering delicacies along with the splendourous view of the rich marine life. It sounds like a fairytale, to be dining with the marvelous coral life of the island surrounding you. The food is amazing, and the restaurant offers private champagne breakfast package along with lunch and dinner that’s equally delectable. A lot of planning and hard work went into the construction of this gorgeous restaurant. The five-inch sturdy glass structure was created in Japan while all the parts were joined in New Zealand. The entire structure was then taken to Maldives by ship and lowered down to its location. This project involved a lot of people who worked tirelessly to turn this dream into a reality. The restaurant, due to its luxurious treatment, is quite expensive and so is not affordable for all. A sumptuous five course meal along with this spectacular underwater experience costs $225 whereas a seven course meal costs $280. Although it’s a one-of-a-kind experience, it will surely burn a hole in your pocket. Due to its location and surroundings, the restaurant excels in seafood and is famous for their preparations of lobster and scallop. However, vegans must not be disappointed as the restaurant also has provisions for them that can be arranged on prior notice. The entire experience is extremely surreal. One must enter the restaurant barefoot. As soon as you step into it you feel like you have been transported into another dimension, with sea creatures surrounding you and the gorgeous corals creating a spectacular ambience it seems to be a dream. Since it is underwater you will be away from the hustle and bustle of life. The peace and quiet alongside the otherworldly visuals will put you in a trance and calm your heart and soul. As it is located underwater, the management takes several precautions to keep it safe and secure so that the customers can have a great time. Its complicated location does not stop them from cleaning the restaurant twice a day with the help of resident divers. They are extremely committed to make this fairytale experience a memorable one for you. However, it does raise the question that a project like this surely has some major impacts on the marine ecosystem surrounding the island. No matter how careful the management is, it still disrupts the lifestyle of these animals in some way or the other and might even cause environmental harm due its position. Water pollution is also a definite issue. I hope the resort has taken these issues into account and done the needful. 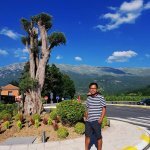 This place is ideal for your aesthetic Instagram account. I hope it’s in your bucket list already!
? Dog Steals GoPro Camera And Records “Perfect” Footage Banksy Painting Immediately Self-Destructs After Being Sold For $1.4 Million ?